In Turkey, Debating A Woman's Right To Bear Arms Hundreds of Turkish women die each year at the hands of men, often their husband or a family member, and many more are routinely abused. Activists say the police and legal response has been dismal. One group has issued a controversial proposal: arming at-risk women and training them in self-defense. 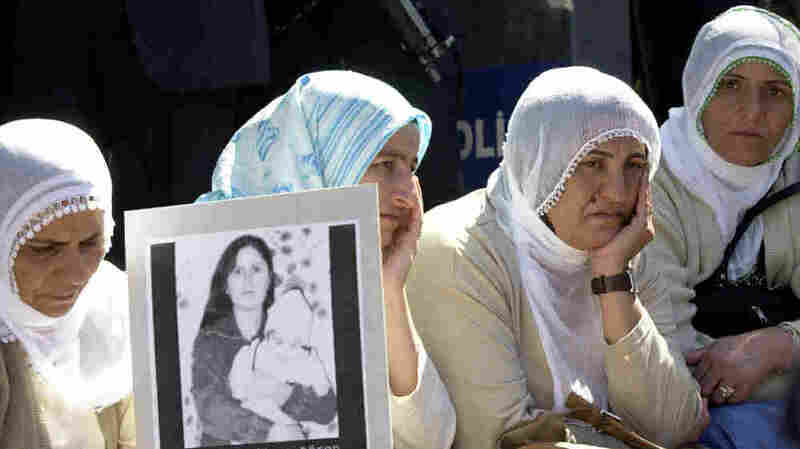 A woman holds a photo of Guldunya Toren, an unmarried mother allegedly killed by her brothers for having a child out of wedlock, outside parliament in Ankara, Turkey, in 2004. Her case prompted huge protests and forced Turks to realize that the justice system often fails to protect at-risk women. In Turkey, hundreds of women die each year at the hands of a husband or family member, in a society that critics say too often ignores violence against women. After years of frustration, one organization has shaken up the debate with a controversial proposal: arming women and training them to defend themselves. Looking back, Yagmur Askin thinks perhaps she should have paid more attention on her wedding day, when her husband's family welcomed her by saying, "You enter this house in a bridal gown, and you'll leave it in a coffin." But as a 15-year-old forced into an arranged marriage to a man she barely knew, she's not sure what she could have done differently. After four years of sexual assaults from her father-in-law and beatings from her husband, she learned the chilling meaning of that sentence while hiding at her family home on one of several attempts to escape. "It was August, the windows were open. I heard a noise and pulled back the curtain, and it was my mother-in-law outside, and she had a gun," Askin recalls. "I jumped and she fired six rounds, and with each shot I swear she was laughing. I was hit twice, in the legs." When the shooting case went to court, the husband's family began to threaten Askin's mother and brothers, and a terrified Askin withdrew her complaint. The mother-in-law spent only 17 days in custody. Activists say on average a Turkish women dies every day in a domestic or "honor-related" homicide, all too often in cases where the police or prosecutors have failed to protect them. Occasionally, a killing moves from the police blotter to the national media, as with the case of Guldunya Toren in 2004. Shot and left for dead, allegedly by her brothers, she was lying in a hospital bed when a man claiming to be a relative was allowed to visit her and killed her. The case prompted huge demonstrations and a song in her memory became a hit. It amazes me that people think it's fine for a shop owner to have a gun to protect his money, but a woman can't have one to save her life. "When Guldunya was shot, there was a criminal case, she was in the hospital, but no one wanted to protect her," says Ilke Gokdemir, who is with the women's rights group Mor Cati. "The state had no interest in protecting her." The women's rights activist says Toren's killing forced Turks to recognize that the justice system too often fails to protect even obviously at-risk women. She blames a macho, patriarchal culture that she says leaves many women feeling powerless to escape from violent situations. In Askin's case, after years of beatings, she did finally demand a divorce. After that, she says, her husband took to beating her in the face with firewood. "He would say things like, 'I'm going to make you not so pretty anymore. I don't want anyone else to see how beautiful you are.' He wouldn't let me use the phone, I couldn't go to the store, I couldn't take the kids to the park," she says. For years, women's rights advocates searched for a way to shake up the debate. Last fall, someone did. Hayrettin Bulan with the women's group Sefkat-Der, which means "compassion foundation," shocked some people with a call for a vigorous self-defense program for women, including giving them guns and teaching them how to use them. Bulan says it's just one of a series of measures his group recommends, but it's gotten by far the most attention. "We're telling these battered women: If the government won't protect you, learn to protect yourselves. Self-defense is a legitimate right. Carry pepper spray, learn martial arts, and yes, go to the range and learn to shoot a gun," Bulan says. "It amazes me that people think it's fine for a shop owner to have a gun to protect his money, but a woman can't have one to save her life." Ibrahim Yildirim, a retired policeman and nationally ranked marksman who now runs a firing range, was not shocked by the suggestion that at-risk women learn to use a gun. On the contrary, he says, if properly trained in how to handle a gun, and especially in when not to use it, it's a sound idea. 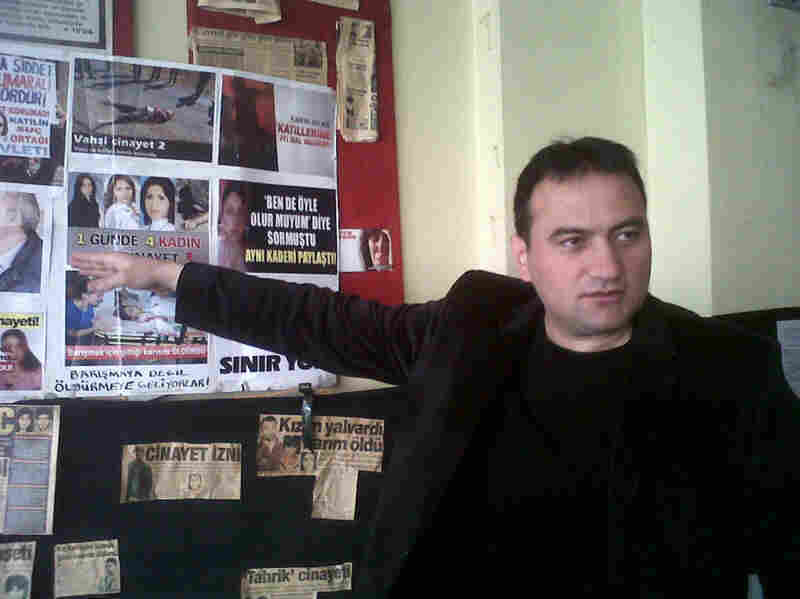 Hayrettin Bulan, a women's rights activist, points to cases of abused Turkish women. His proposal to arm and train women in self-defense has reignited a debate in Turkey about how best to combat violence against women. "What I've seen is that women are actually better at this, they're more receptive to learning and we can teach them faster. Men who've been in the military always want to treat the handgun like a rifle, and re-training them is more work than starting from scratch," he says. Yildirim operates a facility known as the "princess shooting range" — named not to attract female clients, but rather, after the name of the building, which used to house a hotel. He says Turkey doesn't require gun-safety training before issuing carry permits for firearms, but it should, for both men and women. He recommends a three-month training program, as required in many European countries. He says he has about 500 female customers at the range these days, including some whose goal is self-protection. "For those women, I emphasize how to use a gun so that only her attacker is endangered. Sometimes an attack occurs in a crowded public place, and whenever you pull a gun you're taking other peoples' lives in your hands. There are ways of reducing the risk to bystanders, and these are very important to learn," Yildirim says. "So is knowing the law, when using a gun is justified and when it isn't." The proposal to arm battered women has its critics, including domestic violence survivor Yagmur Askin. She can't imagine living in a household where the husband is violent and the woman is armed. "The child will see her father beating her mother and she's going to wonder, 'Is Mom going to kill Dad tonight?' " she says. "Also, I've been shot with a gun, so I'm against them. But I like all the other self-defense ideas — the pepper spray, the athletic training, those are all good things." After seven years of abuse, Askin finally fled and has been in hiding for 16 years — cut off from her family, unable to go to work, afraid to rent a house in her own name. Even so, in a country of 70 million people with only 2,500 shelter beds, she considers herself lucky to have found refuge and support. Bulan, the activist, says even as he struggles to find beds for desperate women like Askin, he's infuriated by the conditions they encounter in the shelters. "Look, for 17 years we've put 10,000 women through the shelter system, and I have to confess, they live like prisoners. We're essentially locking up the victims while the perpetrators walk around free," he says. Women's advocate Gokdemir says if anything, anecdotal accounts of violence are on the increase recently. But she hopes that's because more cases are being reported, which means more women are standing up for themselves. "So even though it sounds really pessimistic to say there is more violence against women, it might be a backlash against women who are becoming more assertive about their human rights," she says. Turkey has a new domestic violence law that does offer some hope — perhaps most importantly, the ability for women to get a new identity. Activists say it remains to be seen, however, whether it will be actively enforced by police and prosecutors.